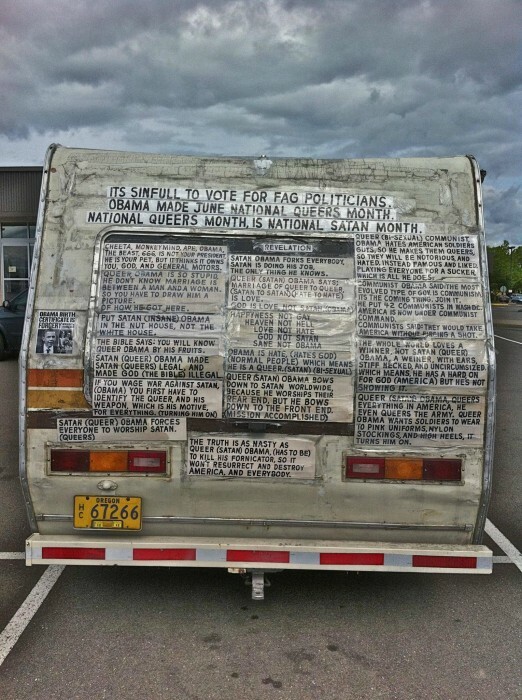 Is that Sarah Palin’s bus?? I would totally celebrate National Queers Month. I was about to post the same thing Natedog. Too bad I can’t find that little vote up thingy. My town has the exact opposite of this. Hippy RV’s. Just as annoying. Funny how many of the posters are calling Obama crazy. You know, “crazy” generally is the best term to describe someone who completely covers the back of their vehicle with extremist rhetoric. Given#1: The author consistently refers to Obama as Satan. Given#2: Radical Muslim Terrorists refer to Obama and America in general as The Great Satan. Therefore the author is a Radical Muslim Terrorist. Given#2: 42 is the Ultimate Answer to the Ultimate Question of Life, The Universe, and Everything. Therefore Obama knows what the Ultimate Question is. I don’t know about any of that, but it’s 5:55 here and I’m struggling with this cup of coffee ’cause my dog is violently licking her cooch like there was gold up in thar hills.